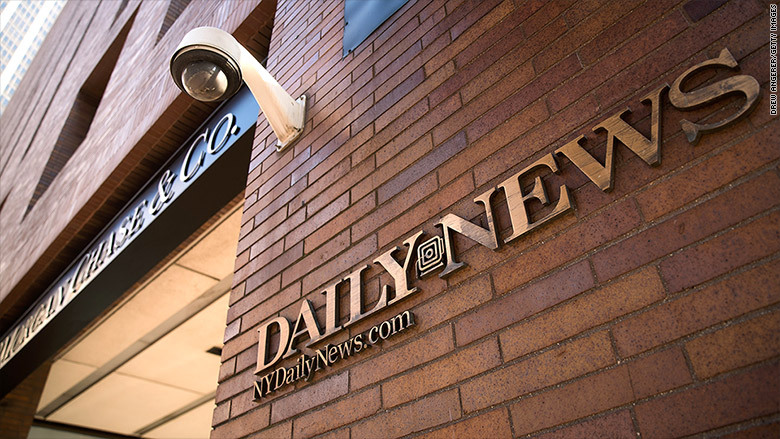 As of Monday, the New York Daily News won't have an editor in chief or a publisher. Arthur Browne, the veteran editor who has been juggling both jobs, is retiring on December 31. The paper's new owner, Tronc, knew about his impending retirement when it bought the paper in September -- but hasn't hired a replacement. So the storied New York City tabloid will operate without official leadership for the time being. When CNN contacted him on Friday, Browne confirmed that his successor has yet to be named. "The office will be broom clean when she or he arrives," he said. Publishers sometimes name an interim editor, but not in this case. "We are in the midst of a search for the next editor in chief of the New York Daily News and expect to make an announcement in the next few weeks," a Tronc spokeswoman told CNN. The company declined to say whether there is also an ongoing search for a new publisher. Major newspapers have historically had separate editors and publishers, with the editor running the newsroom side and the publisher overseeing the business side. But in most of its markets, Tronc (previously known as Tribune) has merged the editor and publisher jobs. Browne, a longtime deputy editor at the Daily News, was named editor in chief back in October 2016, when Mortimer B. Zuckerman still owned the paper. When Zuckerman decided to sell in September 2017, Tronc added publisher responsibilities to Browne's plate. But Browne had previously told Zuckerman that he planned to retire by mid-2018. When Tronc took over, he agreed to stay until the end of 2017, giving the new owner about four months to find a successor. Tronc was not exactly embraced by Daily News staffers. The publisher has been criticized for deep cost cuts at papers like Chicago Tribune and the Los Angeles Times. Its digital strategy, full of false starts and do-overs, has been derided by analysts and onlookers. There was fresh criticism this month when an SEC filing revealed that Tronc chairman Michael Ferro is being paid $5 million per year for the next three years. So as Browne's retirement date neared, colleagues started to wonder aloud -- what's Tronc going to do? Who's going to run the paper? It's become something of a mystery. "I've never heard of a paper functioning without at least an acting editor in chief for any period of time," Browne's predecessor Jim Rich told CNN. "At a moment where local coverage is teetering on the brink of extinction, it's depressing to think that this is the state of affairs at what was once a stalwart of local journalism." Rich is working on launching a nonprofit local news site for the New York area. Browne told CNN he does not have another job lined up. "This former copy boy plans to join my colleagues on New Year's Eve to witness the brilliant construction of my last Daily News front page," Browne said. "I am departing from the Daily News because after almost 44 years it's time to find new interesting, fun, rewarding ways to spend my time. I am exploring several very different paths so at this point: Who knows?" In a statement, Tronc celebrated Browne's tenure at the newspaper. "A Pulitzer Prize-winning journalist, Arthur has served as editor in chief, editorial page editor and led a team that won a Pulitzer for Ground Zero illnesses in 2007. He has led the newsroom through a time of rapid change and we are grateful," the company said.